This is one of the best money books I have ever read, and a golden book that you must read if you want to become rich. I am very surprised and amazed the legendary city of Babylon had such a wise man who had extremely valuable ideas about wealth creation, money making ideas, property investment and other investment ideas in such an ancient time. 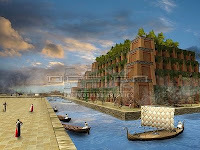 The richest man in Babylon city was called Arkad, he was famed for his great wealth, liberality and generosity. One day, his poor friends who had the same masters and played together when they were young came to his house and asked him the SECRET of becoming rich.